Ibiza’s worldwide fame and success makes it an attractive target for any product looking for a trademark free injection of cool and style. Over the years this has led to some particularly unremarkable Ibiza branded beverages, particularly in beers. Ibiza’s wines are now a protected regional brand, as is Hierbas Ibicencas. Ibiza has some great talent in the world of wine and beer, and Mari Mayans have had the spirits covered since 1880. Here we have showcased four of Ibiza’s finest. If you like the idea of brewing your own Hierbas, try our make your own hierbas recipe. 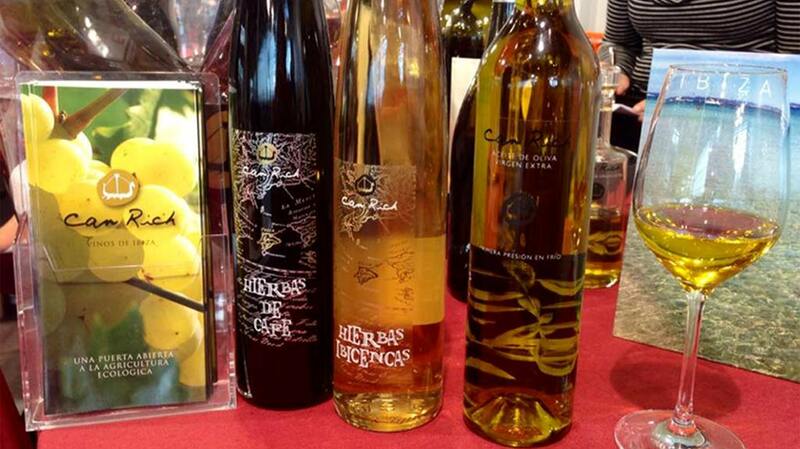 The One & Only Hierbas Ibicencas, and friends. Hierbas, or of course as most of us will have started out assuming, Yerbas, is THE Ibiza drink, by THE maker. With its so distinctive triangular bottle, we may not have loved it the first time we had one, but most come around to it as part of their Ibiza love affair. 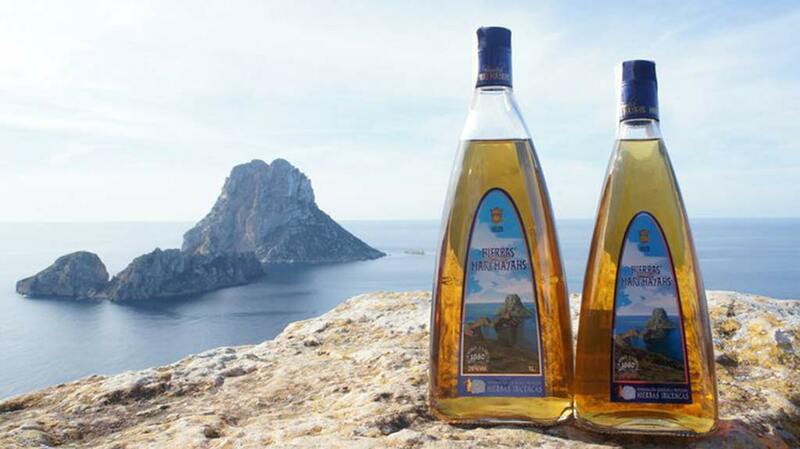 Ask 100 locals what taste they would most associate with Ibiza and 95 will say Hierbas. The other 5 don’t drink. For more than 130 years Familia Marí Mayans has been dedicated to researching aromatic plants and making high quality and tasty liqueurs. This knowledge and the artisan techniques have been passed down through generations ensuring their seal of quality and tradition. Juan Mari Mayans, around the year 1880, had other ideas and with his llaüt he travelled over and back from Barcelona supplying the island with objects and utensils not found there. He knew the secrets of the still and how to distil alcohol. Juan Marí Mayans, had a keen interest in aromatic and medicinal plants and studied their properties, later developing an interest in distilling drinks and liqueurs. Stockists: Everywhere – clubs, bars, restaurants, supermarkets, tourist shops, THE airport ‘flight back’ gift. Price: around 10€ for 70cl (online), but prices vary. 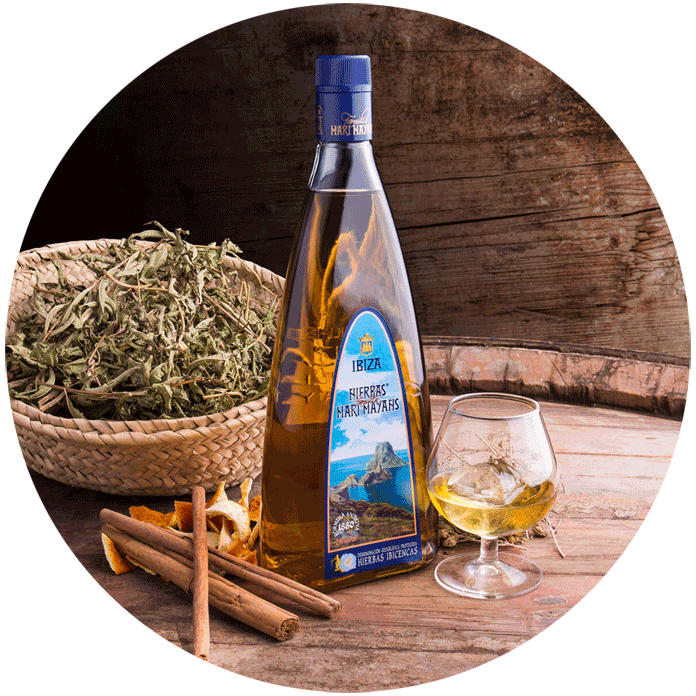 Though best known for their Hierbas, Mari Mayans are the family behind the labels of several other well known local spirits. We will look into the others (hic!) and cover them fully sometime soon. “Born of a unique terrain, the countryside of Ibiza and Formentera – with its rich diversity of microclimates which provide the specific quantities of minerals and moisture that lend its aromatic plants their excellent properties. It is made by distilling selected leaves and stems of Artemisia Absinthium (wormwood) carefully and once they have been macerated with other plants. The result is a spectacular green drink that blurs violently when water is added to it, when doing the process known as ‘Louche’ or ‘Paloma’. It is one of the few 100% natural brands, due to the great difficulty in producing it, since wormwood, if not treated properly, creates substances (called Beta-tuyonas) with strong hallucinogenic properties. is a fine liquor obtained by the extraction of aromas in a copper still, from various plants from the island of Ibiza, mainly the Thyme. In Ibiza and Formentera fields of purple are a common sight in July and August. An ancient tradition says that the picking of this plant should be done very early on the day of San Juan. Appetizer obtained basically by the extraction of aromas of Quina Calisaya (cinchona calysaia) and Gentian (gentiana lutea), adding caramelized sugar that gives that characteristic dark and forceful tone. Palo is the primitive name of the Quina in Spain. This plant native to South America was made known in Spain by the countess of Chinchón around the year 1632, and later spread throughout Europe. Its alkaloid, Quinine, has great properties against fever. It was an ingredient used to curb malaria. The purest grain alcohol is used to distil juniper berries in copper stills. A bunch of thyme leaves is added alongside fresh rosemary and citrus peels to obtain a distinctive Mediterranean Ibizan flavour that is unique to the plants of Ibiza. 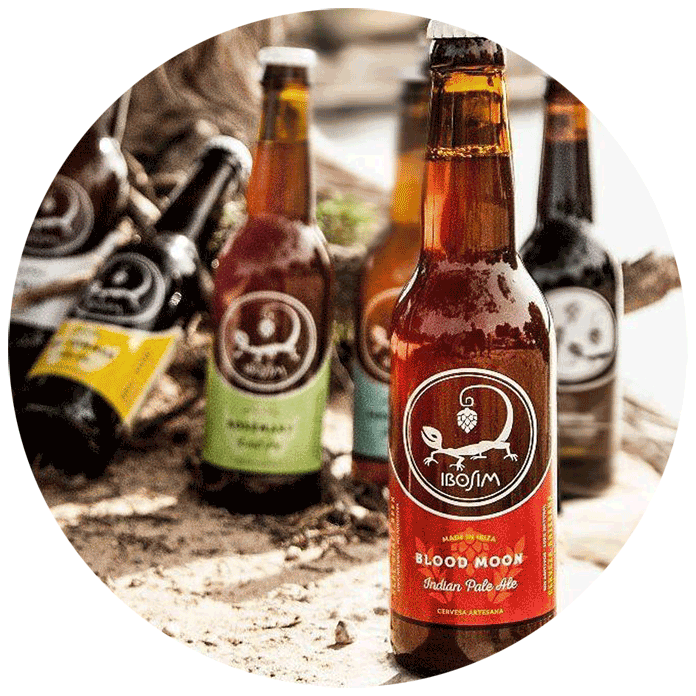 Ibosim BrewHouse is the first microbrewery on the island of Ibiza. They brew a range of Beers that would be perfectly at home in a UK beer festival. Not to be confused with, or dismissed because of, the crop of beers that have put an average lager in a fancy bottle and crowbarred Ibiza into the name somehow, Ibosim are the real deal. Ibosim was the name given to the island of Ibiza by the Carthaginians and means Isle of the god Bes. It is a very apt name for a beer, as the wee Bes was considered the god of good mood and fun. Many refer to him as the party god. We are big fans in the Ibizan office. My personal favourites are the Summer Ale, which also affords the first opportunity in many years to create a ‘Light & Bitter’, and the Rosemary Ale. 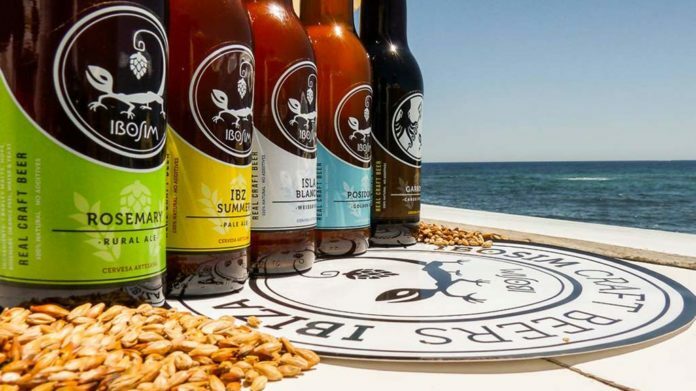 Stockists: Maxims Rock Bar in Cala de Bou is a great place to drink it as Jane lets you select your own music whilst drinking (providing it is guitar based obs), and of course the Ibosim bar, which is also the microbrewery, in Port Des Torrent. The Ibosim range is available throughout the island, and they are often found with a cask or two at Ibiza’s many artisan fairs. Isla Blanca is a smooth and balanced wheat beer. A fresh and Mediterranean interpretation of traditional German Weissbier. Our apocalypse beer for hop lovers. Aroma explosively fruity, complex and enveloping. Robust and balanced. Ibz Summer is a bold and different beer, with a slightly coppery color, aromatic with hints of mango, passion fruit and orange. Rosemary, is our most rural beer. It is an amber beer with sweet hints and notes of spices thanks to the addition of orange peel and rosemary. Nick Gibbs, Review: I know what you are thinking, so am pleased to reassure you that it doesn’t taste anything of Rosemary. Actually it does, but I know hearing that would put many a beer drinker off. It is more a background note, really subtle. The important thing to stress is that it is not some hippy dippy vegan thing, it is not the same as comparing sweet jasmine and mint tea to PG Tips. This is very much the PG Tips end of the beer spectrum. I was never a huge bitter drinker in the UK. It was a once in a while thing. A Sunday lunchtime with trad jazz kind of thing. Rosemary fills that gap very nicely. Whether or not it is your personal taste, from a pure brewing perspective, I think for anybody who knows anything about beer, a taste of Ibosim’s Rosemary Rural Ale will immediately tell you these guys are serious about their beer and about the brewing process. This collaboration between Cerveses Popaire & Ibosim is a tribute to our Mediterranean origins. The fruit of the carob tree, which is ever so present in Ibiza’s landscape, is the main focus of this dark beer with sweet notes of cocoa and nuts. Can Rich were pioneers in the application of organic farming in their vineyards. ‘The Phoenicians brought the wine culture to our island, so the wines made at Can Rich pay homage to the first men and women who crossed the lands of Ebusus’. 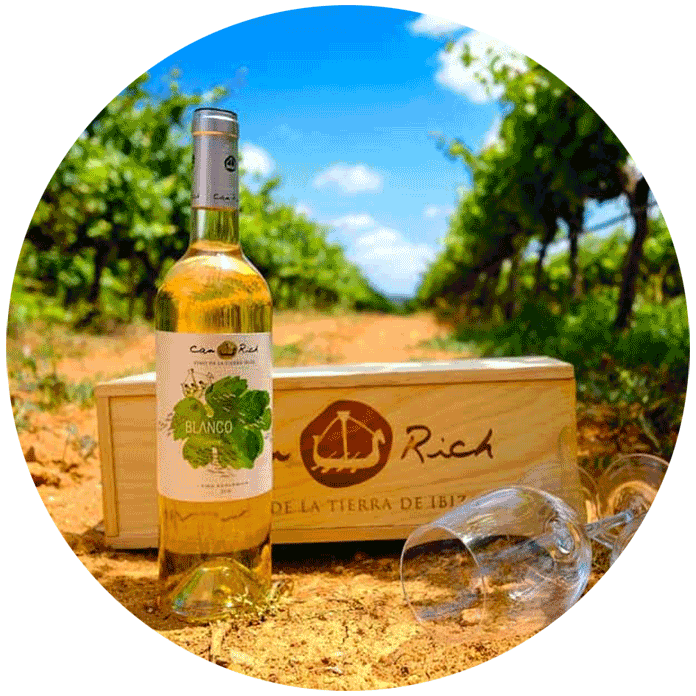 Can Rich began its activity in 1997 by planting 17 hectares of vineyards with traditional and foreign varieties. In 1999 the winery was built, incorporating new processing techniques and in 2007 they planted a new plantation of 4 hectares of vineyards and 3,000 olive trees exceptional environments, such as the Ses Salines Natural Park. Care is taken in understanding the culture of the wine and the respect for nature is reflected in the quality of their products, which serve to convey the uniqueness of the climate and the lands of Ibiza. The harvest is picked manually in the month of August and the grapes transported as quickly as possible to the winery to avoid oxidation. The vines are conducted in trellises and cultivated following the rules of the Balearic Council of ecological Agrarian production. They have a large selection of wines produced. Along with the 4 listed, they have Tinto Selection, Bes Rosado Can Rich, Blanco Ereso, Tinto Lausos and Vino Dulce de Licor Can Rich. Stockists: Many bars and restaurants will have it on their wine list, and it is readily available in most larger supermarkets and many bodegas (off licences). After a smooth pressing of the grapes you get a must-have flower, which is fermented in stainless steel tanks at controlled temperature. After a crushing and destemming, fermentation-maceration is carried out in stainless steel tanks at a controlled temperature. After a crushed and destemming, fermentation-maceration is carried out in stainless steel tanks at controlled temperature and later ageing in French and American oak casks. Situated on Ibiza, Ibizkus Wines produces premium rosé, red and white wines from local grapes including Monastrell. Founded in 2007 as Totem Wines, Ibizkus Wines S.L. has established itself as a leading wine producer on the island. During the 2015 year, their cellars have produced around 60.000 bottles of rosé, red and white wines. Ibizkus started producing wines on the island in 2006 under the name Totem Wines primarily using Monastrell grapes. While not as famous as some of their siblings, Monastrell grapes, also known as “mataró” or “mourvèdre,” are capable of producing fruity, easy to drink, modern and high quality wines. 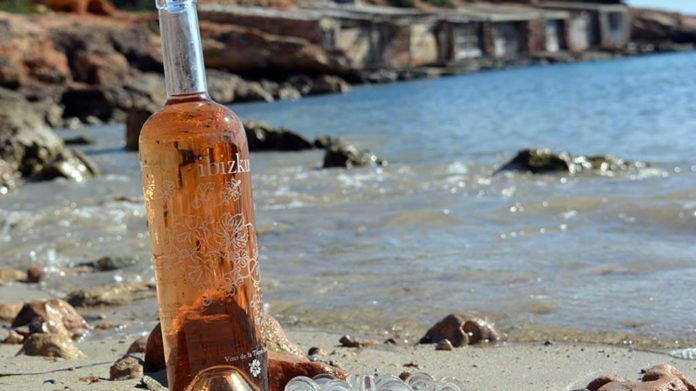 Ibizkus started with a rosé and red wine and finished bottling its first white wine which was marketed to the public during the Summer of 2016. Stockists: It is available in many supermarkets and restaurants (Including our favourite Tulpon the San Antonio beach promenade) around the island. You can visit the wine cellars in San Mateau. Camí Vell de Sant Mateu, s/n, Santa Gertrudis. A fresh and cheerful wine. Floral and raspberry notes dominate the nose. In the mouth it is intense and generous. A white that drinks very simply and is ideal to see the sunset over the sea on a summer day. A great Ibiza wine that drinks easily and brings much joy. A perfect red for summer. A wine made in the traditional style that is recommended decanted.